Newberry National Volcanic Monument was established in 1990 to preserve its unique features, its history in the lives of Native Americans, and the beauty of the area. 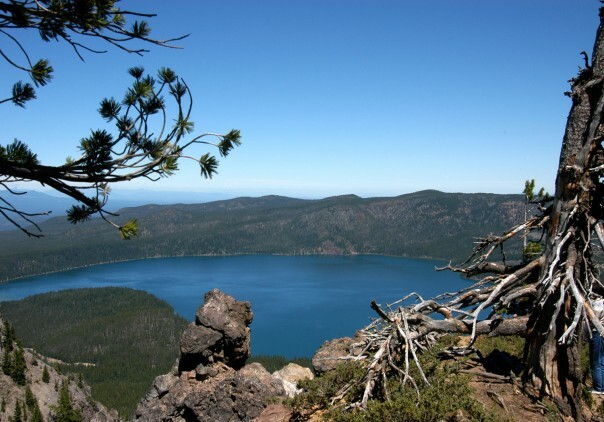 The Newberry Caldera area is often overlooked and is an incredible example of unspoiled Oregon beauty. The wildlife viewing and accessible geologic features are protected while visitors can camp, fish, boat, snowmobile, ski, hike or visit one of the two old-style cabin resorts located on East Lake and Paulina Lake. Its close proximity to Hwy 97 (only about 10 miles) makes it easy for visitors to find and enjoy this wonderfully preserved area of geologic history and stunning beauty. This natural site includes multiple geologic features including Oregon’s “other crater lake(s)” inside a huge defined caldera, a massive obsidian flow used by Native Americans for thousands of years for arrowheads and tools, many trails, hot springs, waterfalls, ice caves, rivers, lava flows, geothermal features and incredible views from atop Paulina Peak (accessible by cars). The Big Obsidian Flow is 1,300 years old and is the youngest lava flow in Oregon. A one-mile interpretive trail climbs up and onto this impressive lava flow of obsidian (black glass) and pumice. Along the trail there are seven interpretive signs that discuss the geology, biology, history and archaeology of the Big Obsidian Flow.